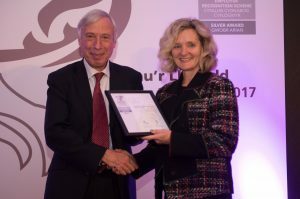 Cardiff and Vale University Health Board (UHB) has once again been recognised for its commitment and support to Defence at the Wales Defence Employer Recognition Scheme and Armed Forces in Wales awards ceremony. Cardiff and Vale UHB recently received the prestigious Silver Level Award which recognises employers who actively demonstrate support for Defence and at the highest national level. In order to gain a Silver award, holders must meet a certain criteria, such as employing members of the armed forces and upholding an actively positive stance with established HR policies, enabling them to show flexibility towards their annual training commitments and mobilisation of reservist employees. Fiona Jenkins, Executive Director of Therapies and Health Science and Armed Forces Executive lead at Cardiff and Vale UHB said, “We feel very proud to have once again received a Silver Award from the Ministry of Defence for our commitment and support to Defence. The Ministry of Defence launched the Employer Recognition Scheme in 2014, to reward and recognise employers for their support and commitment towards Defence. A dedicated website https://www.gov.uk/government/publications/defence-employer-recognition-scheme/defence-employer-recognition-scheme supports the Employer Recognition Scheme allowing organisations to declare their support at Bronze level and for nominations to be made for both Gold and Silver awards. Stuart Egan the Cardiff and Vale UHB Independent Board member (Trade Union) and Armed Forces Champion was also shortlisted for the Armed Forces Covenant award for his commitment to deliver the covenant principles.